When the five senses come together in perfect harmony, a sixth sense is born as a magical feeling of completeness. This is the story of Palm Island Resort, which has been created with an acute understanding of quality and value, while ensuring a sustainable environment for those that frequent Palm Island to nest, hatch and feed. Palm Island Resort has all you want when planning your vacation. Palm Island Resort has several different dining options. Whether you want to have a casual dinner with the family or a fancy night with your significant other. Don’t forget – to stop by the gift shop for souvenirs either to commemorate your trip or for your loved ones back home. Palm Concierge services is available to assist you in the details of any Resort sponsored event. 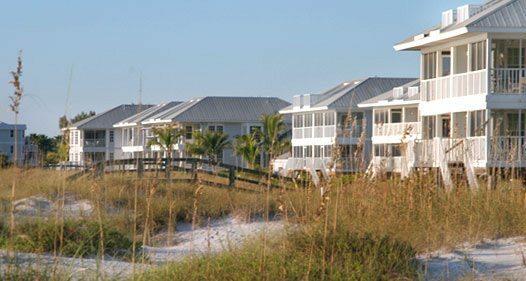 Resort lodging features our Island Beach Villas with their expansive views of the beach and Gulf of Mexico. Guests arriving by boat may prefer our two-bedroom Bay Villas, located next to our island docks. Land’s End Cottages are duplex condo-style residences which all feature three bedrooms with direct access to the beach and water. A number of private residences on Palm Island are available for rental, both within and out from the resort.